Take a look inside Solberg Hall! Charles Orin Solberg Hall, named after the 11th president of Augustana, is home to 220 first-year students.The four-story building has two kitchens, laundry facilities, lounge areas, a computer lab, and a chapel. Solberg is also home to the Campus Clinic. Each room includes a built in desk, dresser, wardrobe closet and bed with Twin extra long mattress which can be lofted. All utilities and laundry are included. Cable TV can be added on for an additional fee. 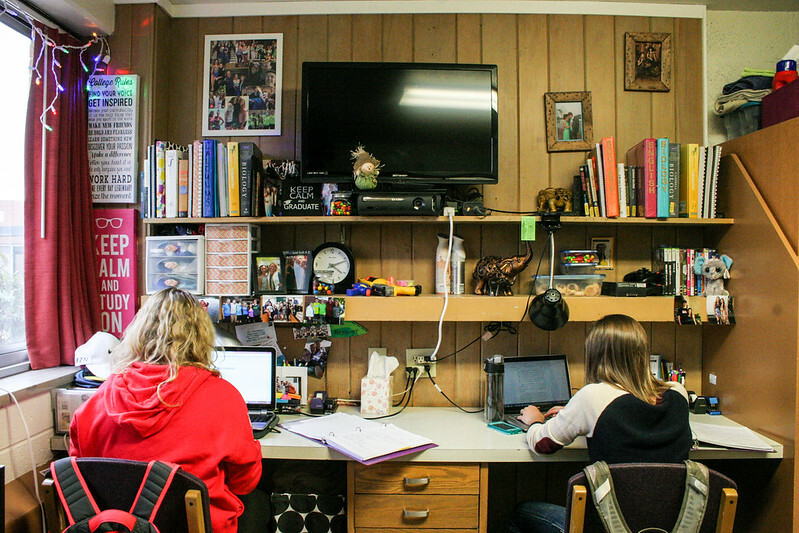 Solberg Hall rooms are spacious and comfy with plenty of room for studying or visiting with friends! Solberg is staffed by six Viking Advisors (VAs) and one professional hall director. While you can usually find staff in the hall throughout most any day, designated VAs are required to be in the building and accessible to students every night after 7 p.m.